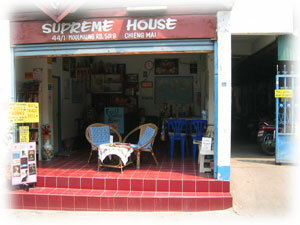 Supreme House is the guest house I stay at in Chiang Mai, Thailand. I've spent far too much time there for my own good. It's a frayed, industrial-looking place that nevertheless attracts a fiercely loyal clientele. As Peter the manager says, "I don't know why people stay here." Neither do we. But we love it just the same. If you do too, then please download the T-shirt, print up a decal and share your sentiments with the world. For those of you who haven't experienced the uncommon splendor of Supreme House, take a gander at the SH Calendar I designed for my friend Dennis' 60th birthday.